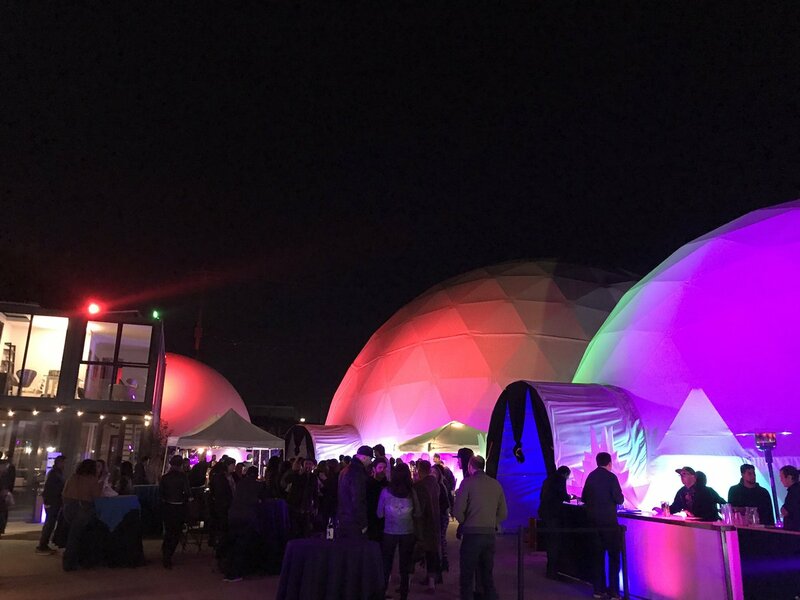 You’ll know you’re there when you see several glowing domes in downtown LA. 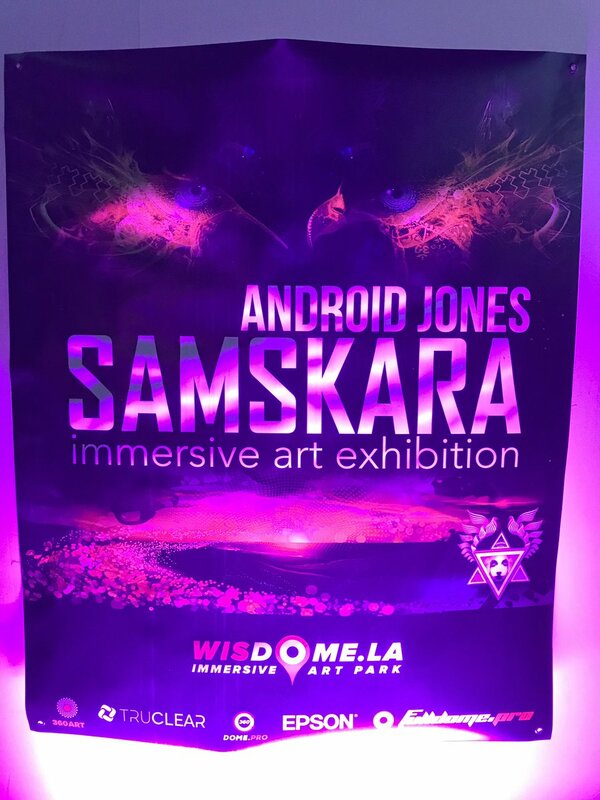 Samskara is the name of the immersive experience featuring the artwork of Android Jones in VR, gallery, and dome projections at Wisdome LA, a pop-up collection of domes in downtown LA arts district. 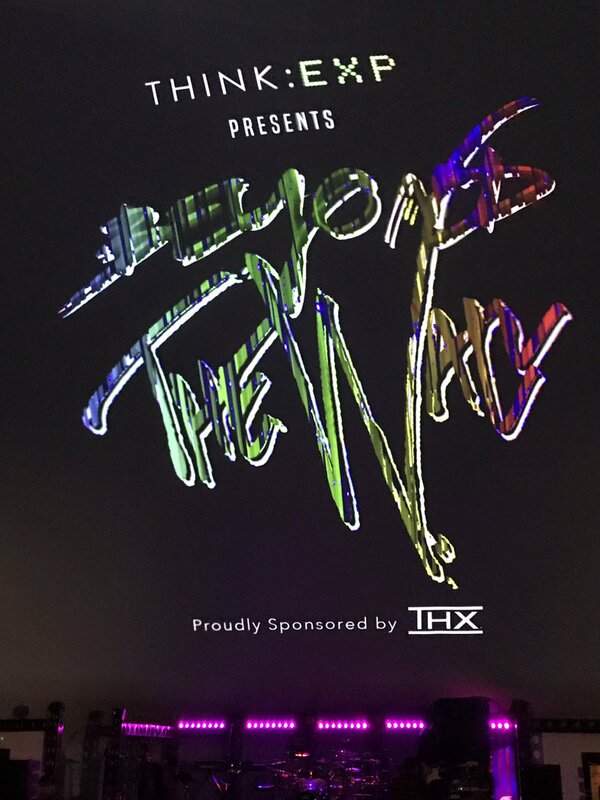 The main attraction is the “Beyond the Wall” 90-minute concert featuring a band performing Pink Floyd songs for 90 minutes with full dome projections, laser art and, even a glow-in-the-dark hula hoop artist. 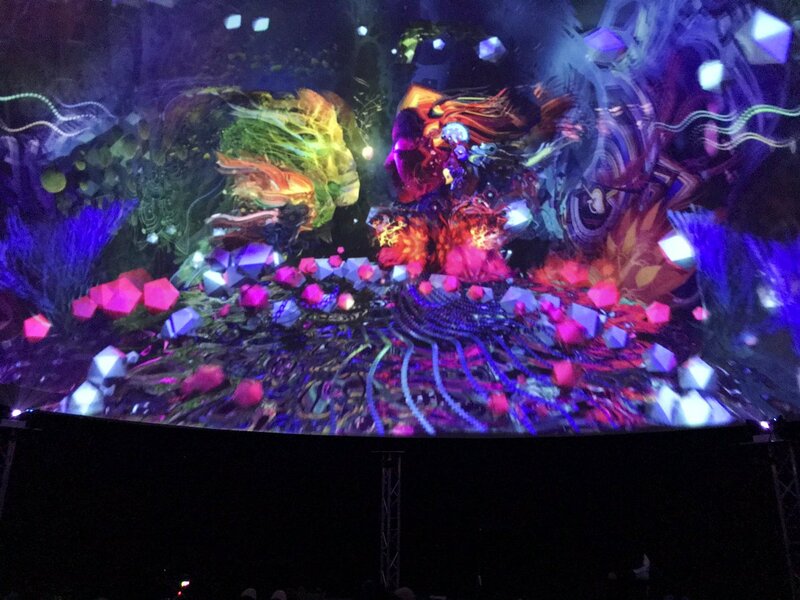 The huge 360 dome is a fully immersive experience, with amazing visuals that transport you to moonlit landscapes, mystical forests, and other galaxies. 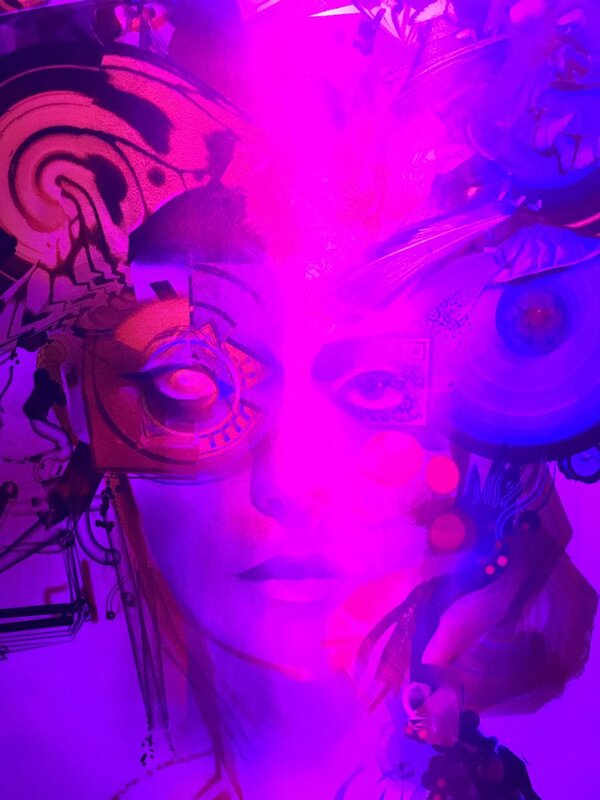 At Samskara, each of the five domes features a different aspect of Android Jones’ work. Here’s what’s in domes 1-5, from Dome 1, closest to the entrance, to Dome 5, furthest. 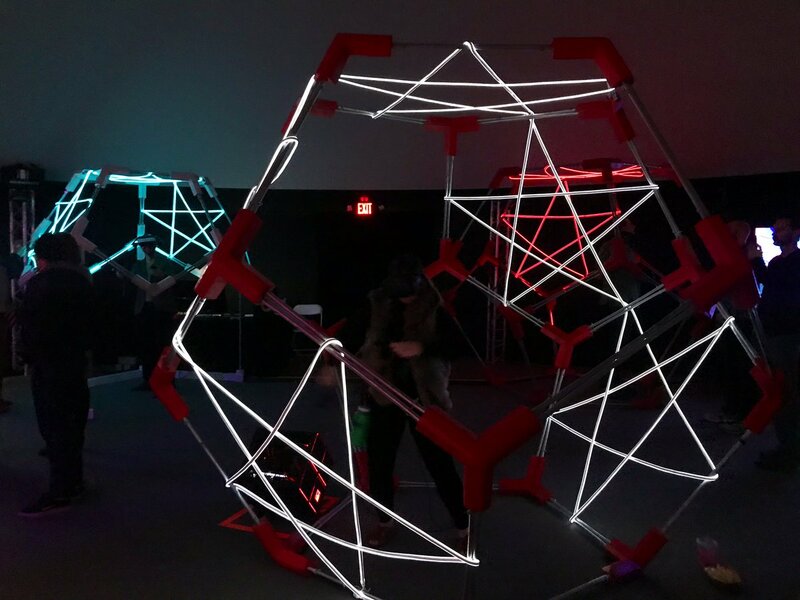 Dome 1 features dandelion sculptures and artwork, with a mirror maze entryway. plus two protection mapping faces overlooking the dome watchfully. 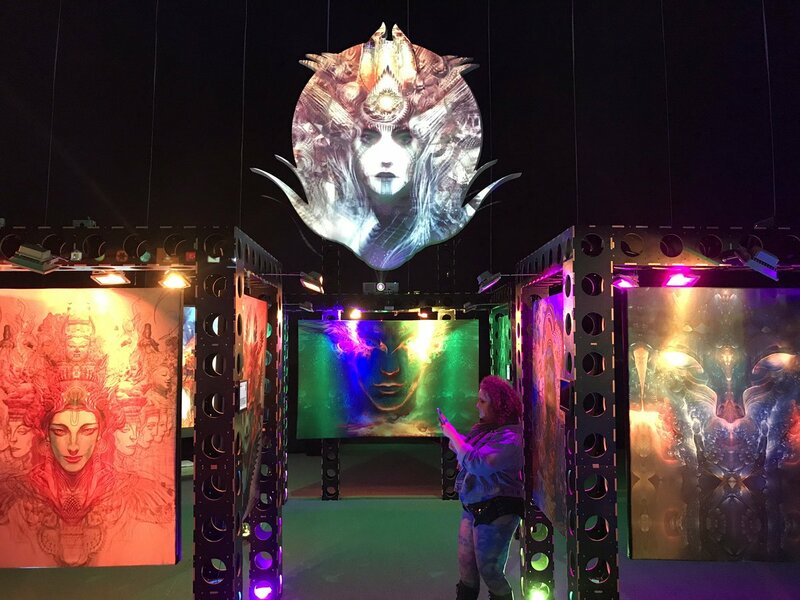 Dome 3: Microdose VR features three VR experiences that put you in the artwork, plus a gift shop to buy some art. Dome 4 Main Stage. 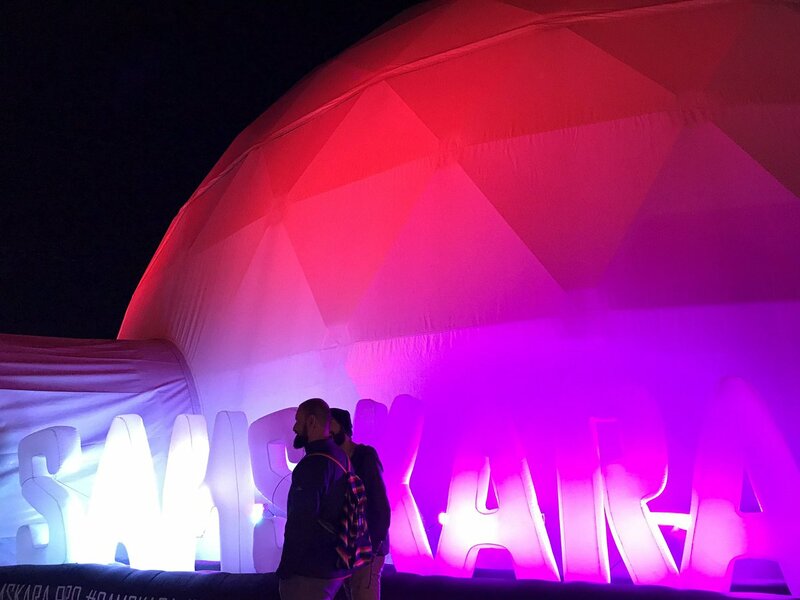 The biggest dome can seat a few hundred people to watch the dome projections. 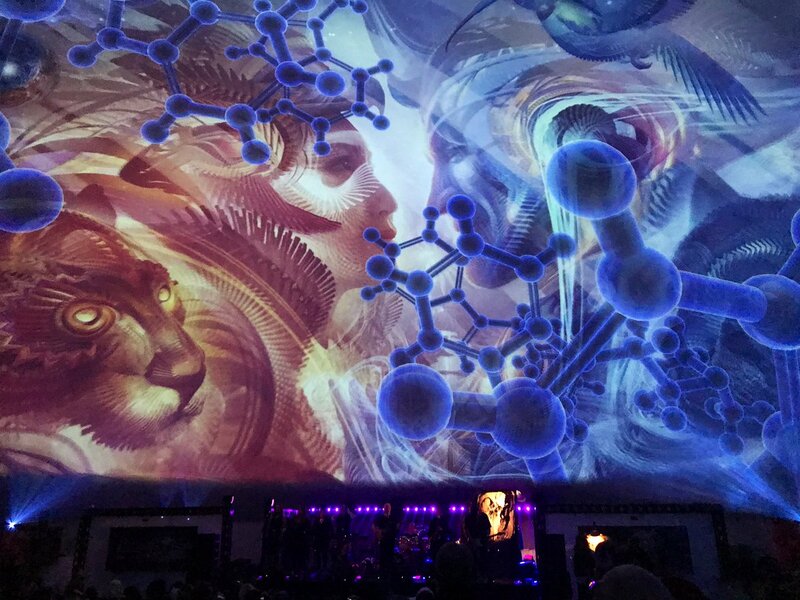 On select days, a band performs Pink Floyd music while you watch projections. Dome 5 chill dome features some of the same images of Dome 4, on a loop with sound. You sit on the floor, on beanbags or in chairs to absorb the projection images. There’s also a VIP area near the entrance with complimentary snacks on certain days. Look for these glowing things at the entrance. 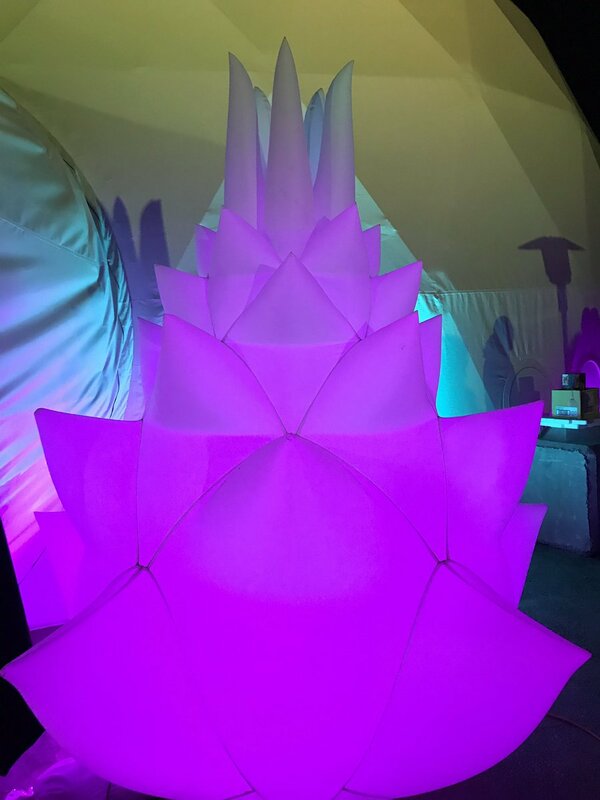 Wisdome LA is a new pop-up venue consisting of five domes in the Downtown LA arts district, just a few blocks from the Urthe Cafe downtown. 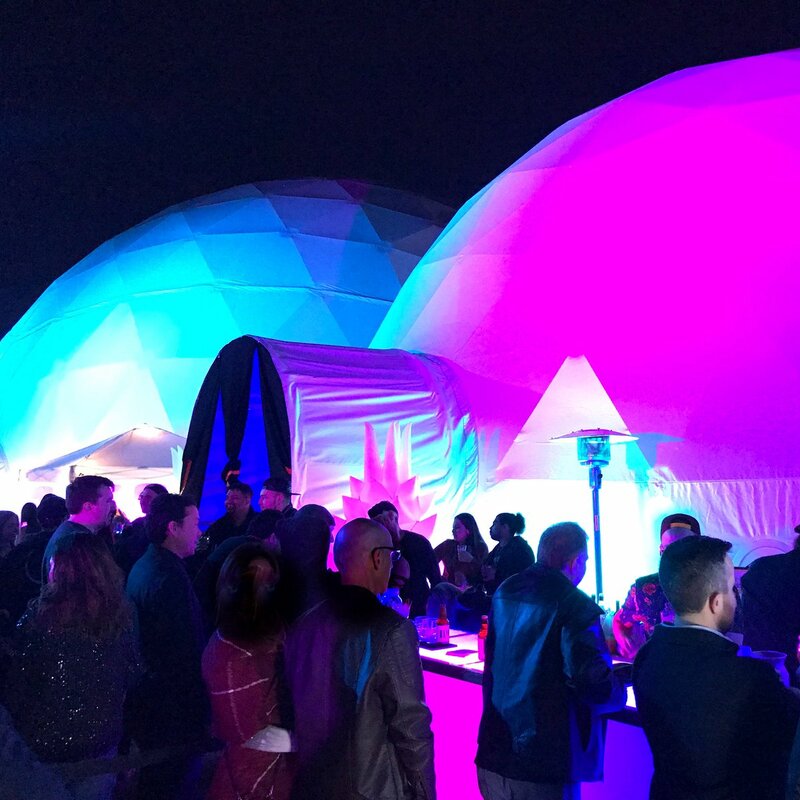 The venue includes five domes to explore, plus several food trucks, a VIP area, and firepits to relax. Wisdome opened at the end of last year, and is schedule to be in LA for three more years. 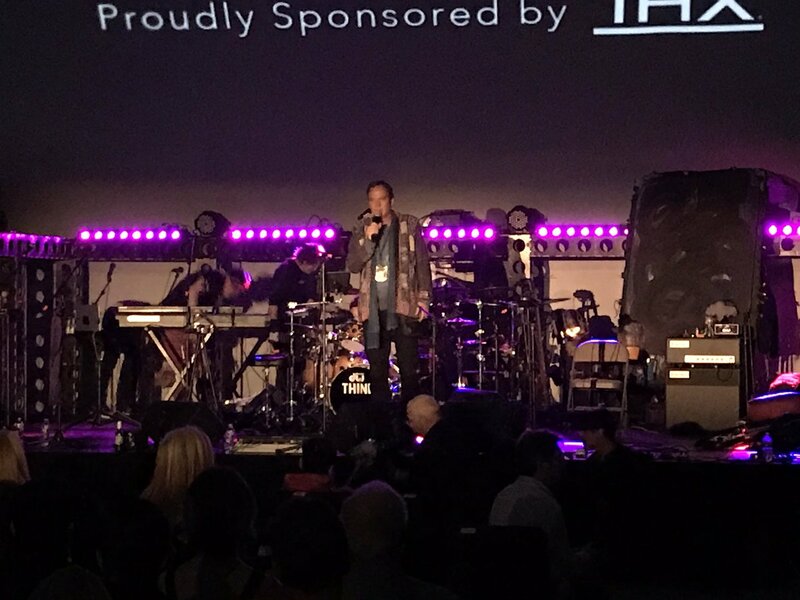 Wisdom is available for special and corporate events.